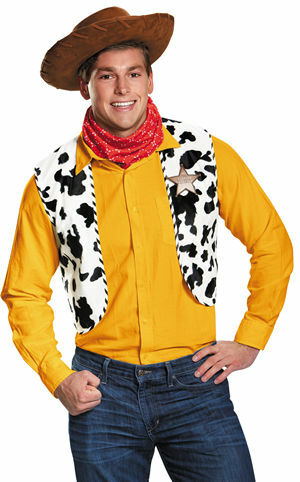 【トイストーリー/ディズニーライセンス商品】ウッディー仮装キット。Adult Deluxe Woody Kit includes a lightweight brushed tricot printed handkerchief, brown felt cowboy hat, and a heavyweight brushed tricot cow print vest with attached vinyl sheriff badge. Add your own jeans and western shirt! One size fits most adults.